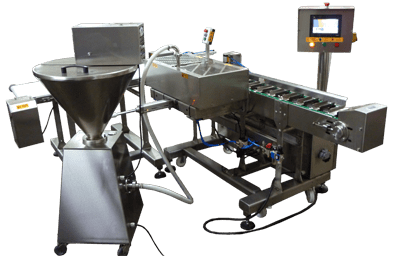 We design and manufacture fully and semi automatic systems for the food industry. 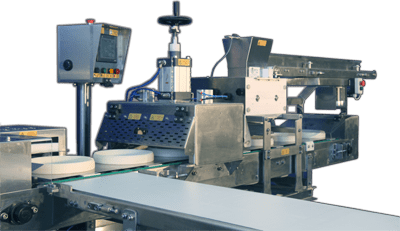 Machines for producing breadsticks, cookies, tarts, special lines for filling (suitable fo éclairs, croissants, wafer rolls, profiteroles etc. ), extruders, filling (depositional) machines, conveyor systems and deposition machines. A conveyor belt for placing the product on steel trays. The tart (&PIE) making machine is manufactured entirely by AISI 304 stainless steel. It uses a conveyor belt to transfer the tart molds in boxes, which are manufactured according to the client’s specifications. It places the dough in the mold and then shapes it with a special shaping die. The speed of the belt as well as the quantity of the dough can be adjusted. The molds and the shaping die can be easily changed, so as to produce a large number of different codes. Model TMB can produce tart shells with a range of diameter 130mm-280mm and is equipped with Automatic Dough Feeder. Capable of filling various products like, Eclairs, Donuts, Small Cups etc. Suitable for small and large food industries. Guided by Omron Touch Screen. Memory for saving customers recepies. Equipped with PLC’s, Proximities, Inverters & Photocells. Control System of filling and presence of products. Capability of precise regulation of quantity and continuous flow that regulates easy. Deposition of the filled products in a conveyor.